Every September, custom installers of high-end home theaters and smart homes descend upon the CEDIA Expo to see new products and technologies. Integra, Onkyo’s brand for the custom installer and home-theater market, isn’t waiting. 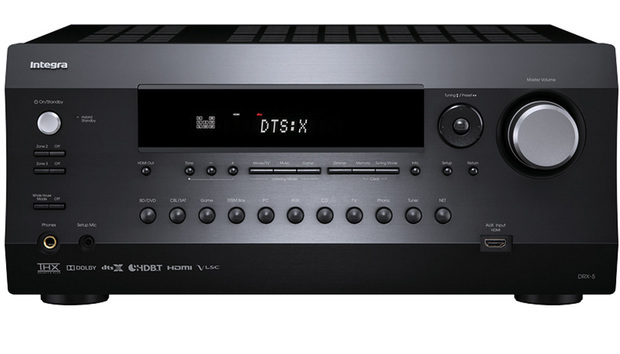 It’s already shipping its new DRX series of 7.2-channel network AV receivers. It goes without saying that these new receivers feature IR inputs and outputs, 12-volt triggers, RS-232 ports, and IP (Internet Protocol) compatibility, so that they can be integrated with high-end smart-home systems from vendors such as Crestron, Control4, and others. On the video front, each of the new DRX units supports 4K/60 Hz HDMI inputs and outputs with HDR (High Dynamic Range), 4:4:4 color space, BT.2020, 4K/UltraHD upscaling from 1080p, and HDCP 2.2. Just about every cutting edge-audio technology is available, too, including Dolby Atmos and DTS:X 5.1.2 configurations. It’s odd, however, that the top-end models don’t support a full 5.1.4 configuration with four height speakers. And there are only seven pre-outs, so you can’t use an external amplifier to make a 5.1.4 configuration. As is the case with most receivers being released, DTS:X support is coming this summer as a future firmware release. Integra DRX-3 rear panel view. The DRX-2 and DRX-3 have wireless network connectivity, but not advanced hardware features such as HD-BaseT. The top models in the line do. The Integra models are among the first receivers on the market that will be ready to decode MQA (Master Quality Audio) files. MQA is an authenticated audio format guaranteeing that the listener can be sure they are hearing exactly what the artist recorded and approved in the studio. The DRX-line supports a wide assortment of hi-res music formats and streaming formats including Google Cast and AirPlay. Internet radio, and subscription services such as TuneIn Radio, Pandora, Spotify, and Tidal are also on-board with Tidal support coming in a future firmware update. While the top-of-the-line DRX-4 and DRX-5 models sport ethernet, they don’t have either Bluetooth or Wi-Fi like the entry level DRX-2 and DRX-3. The only rationale for this might be that more-expensive installations will have structured wiring, which is more reliable and doesn’t have the latency and potential interference problems associated with Wi-Fi. Slated for a summer 2016 release, the DRX models will receive support for FireConnect. Powered by Blackfire, FireConnect is a wireless multi-room technology that can distribute any analog and digital audio signal wirelessly—from vinyl to Hi-Res Audio—to a compatible wireless speaker throughout the home. The new Integra DRX models support Dolby Atmos and DTS:X configurations up to 5.1.2. The DRX line includes intelligent Zone 2 auto-switching, which allows a 7.2 channel main zone or 5.1.2 Dolby Atmos and DTS:X setup to automatically change output to 5.1 channels, plus Zone 2 stereo, when Zone 2 is turned on. The entry-level DRX-2 ($800) and DRX-3 ($1000) feature app-based streaming, Wi-Fi, Bluetooth, UltraHD 4K video and object-based audio. The DRX-2 is rated to deliver 80 watts per channel (with 8-ohm speakers) and 25 amps of high-instantaneous current capability (HICC), along with the latest spec HDMI connectivity (six inputs and one output). The DRX-3 offers 100 watts per channel (with 8-ohm speakers) and 30 amps of HICC. It has eight HDMI inputs (one in front) and two outputs. Both the DRX-3 and DRX-2 feature Bluetooth technology and a dual-band 802.11a/b/g/n Wi-Fi adapter. Support for the less-crowded 5GHz frequency band should reduce interference from other wireless devices operating on the 2.4GHz band. The upper-end DRX-4 ($1300) and DRX-5 ($1700) have a number of key features over their entry-level relatives, which promises to make them good complements to large, complex, or demanding installations. The DRX-4 and DRX-5 are THX Select2 Plus-certified, ensuring theater-grade performance in larger listening rooms. THX certification also provides additional THX processing modes and Loudness Plus. These two top models also feature Zone 2 HDMI matrix switching. Rear view of the Integra DRX-5 with HD-BaseT connectivity. The DRX-4 and DRX-5 sport HDBaseT output, which enables you to use twisted pair copper cabling (STP or UTP) to transmit HDMI signals over long distances that HDMI cables will not support. While the DRX-4 comes in at 110 watts per channel (with 8-ohm speakers) and HICC at 35 amps, the beefier DRX-5 is the more powerful of the two with 130 watts per channel (with 8-ohm speakers) and 40 amps of HICC. The DRX-5 features Onkyo’s VLSC (Vector Linear Shaping Circuitry, a technology designed to improve the digital-to-analog conversion process) on all channels, and it includes Zone 3 audio to go along with Whole House Mode for synchronized, house-wide audio. The DRX-5 also features a separately assignable Zone 2 DAC for HDMI Audio, SPDIF (PCM), NET (network) and USB sources, while the Zone 3 DAC handles NET and USB sources. All four DRX network AV receivers are available now from authorized Integra dealers and integrators.